Grow your business with strategic market insight you can’t get anywhere else. 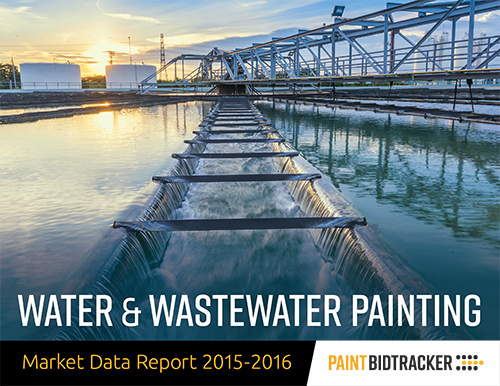 Paint BidTracker’s 2015-2016 Water & Wastewater Painting Market Data Report gives you a bird’s-eye view of agency and contractor activity and trends, based on details of our fully researched Water & Wastewater project leads confirmed to have painting work and a submittal date between 2015 and 2016. Transform the way you reach your prospects with contact information for key market players, including more than 3,000 letting agencies, 1,200 engineers and more than 1,700 contractors active in the water & wastewater sector on verified painting contracts during 2015 and 2016. Order the interactive Excel edition to easily compare data by state and year over year, or order the hard copy if you prefer a printed report. Save big with the bundle and get both reports for $9,995 — a savings of more than $2,500! Interested in bridges, too? Bundle this report with Paint BidTracker’s 2015-2016 Bridge Painting Market Data Report. Get both reports in the print format and save over $2,000. Or order the reports in an interactive Excel format to save over $5,000!